Diogenes the Cynic, was a Greek philosopher, who was born at Sinope about 412 B.C., and died in 323 at Corinth. His father, Icesias, a money-changer, was imprisoned or exiled on the charge of adulterating the coinage. Diogenes was included in the charge, and went to Athens with one attendant, whom he dismissed, saying, "If Manes can live without Diogenes, why not Diogenes without Manes?" Attracted by the ascetic teaching of Antisthenes, be became his pupil, despite the brutality with which he was received, and rapidly excelled his master both in reputation and in the austerity of his life. The stories which are told of him are probably true; in any case, they serve to illustrate the logical consistency of his character. He inured himself to the vicissitudes of weather by living in a tub belonging to the temple of Cybele. The single wooden bowl he possessed he destroyed on seeing a peasant boy drink from the hollow of his hands. On a voyage to Aegina he was captured by pirates and sold as a slave in Crete to a Corinthian named Xeniades. Being asked his trade, he replied that he knew no trade but that of governing men, and that he wished to be sold to a man who needed a master. As tutor to the two sons of Xeniades, he lived in Corinth for the rest of his life, which he devoted entirely to preaching the doctrines of virtuous self-control. At the Isthmian games he lectured to large audiences who turned to him from Antisthenes. It was, probably, at one of these festivals that he craved from Alexander the single boon that he would not stand between him and the sun, to which Alexander replied "If I were not Alexander, I would be Diogenes." On his death, about which there exist several accounts, the Corinthians erected to his memory a pillar on which there rested a dog of Parian marble. His ethical teaching will be found in the article Cynics. 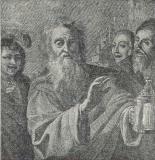 It may suffice to say here that virtue, for him, consisted in the avoidance of all physical pleasure; that pain and hunger were positively helpful in the pursuit of goodness; that all the artificial growths of society appeared to him incompatible with truth and goodness; that moralization implies a return to nature and simplicity. He has been credited with going to extremes of impropriety in pursuance of these ideas; probably, however, his reputation has suffered from the undoubted immorality of some of his successors. 412 BC Born in Sinope. Captured at sea. Sold as a slave to Xeniades. 336 BC Met Alexander the great and asked him to move. 323 BC Died in Corinth. Diogenes looking for an honest man. 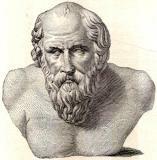 Antisthenes Cynic philosopher who was student of Socrates and teacher of Diogenes. Xeniades Corinthian who purchased Diogenes after he was captured by pirates.